The summer bounty of vegetables in my garden has started to slow down. In these last weeks the tomatoes have been ripening at a steady rate. 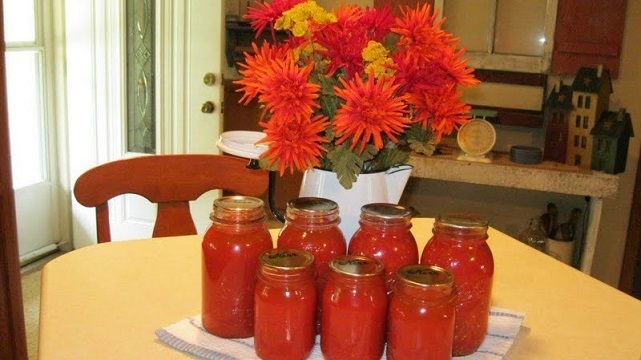 So this busy gardener has been canning, freezing, eating, then canning, freezing and eating some more, until I feel like a tomato! I use a variety of ways to preserve the harvest. I generally can or freeze tomatoes. There are canning instructions on the internet for pressure canning, hot bath canning, and open kettle canning. A quick search will help you find the method that works well for you. 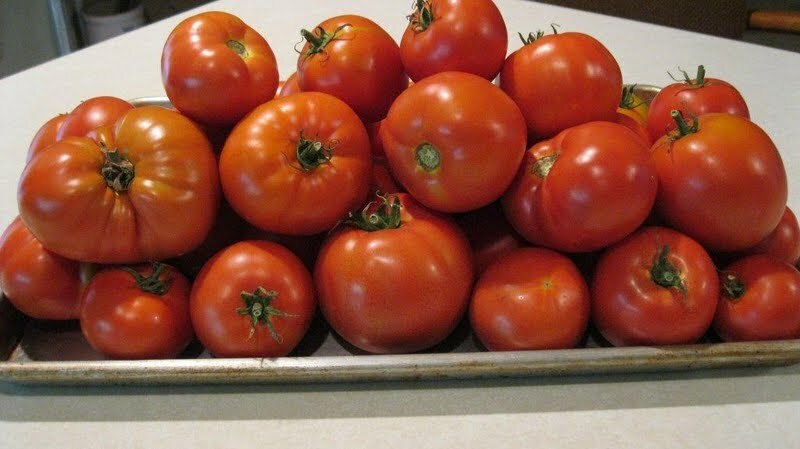 Generally I will can chunky tomatoes to use in sauce and to make tomato juice for use in soups. I also will simply cook tomatoes in a pan and after letting them cool down, will place them in a plastic bag and freeze. In my garden you will also find a variety of peppers. I plant green, red and yellow bell peppers. I also planted a couple of banana peppers this year as the little guy around here likes them roasted with veggies on the grill, cut in strips for sub sandwiches or just to eat plain! It is possible to freeze peppers as well. You can dice them and throw them in a freezer bag. No need to thaw them if using in a casserole or soup. I just use what I want from the bag, and put the rest of the bag back in the freezer until I need it again. Peppers tend to be a bit watery after they are frozen so I find they don’t work well for things like pizza toppings. You can also cut peppers into strips and use in quick cooking dishes like a stir fry. I don’t thaw the peppers when I use them for a stir fry. I just throw them in the last couple of minutes of cooking. Small peppers, like hot peppers can be just washed and frozen whole with the seeds still inside. Stuffed peppers are great frozen as well. I just wash the pepper well and dry it off then cut off the top and remove the seeds and white membrane. Next, I fill the peppers with a meat mixture. A simple mix of ground beef, rice, tomatoes and seasoning works great. I then put the stuffed peppers in a large muffin pan and put in the freezer until almost completely frozen. Remove them from the muffin tin and place in freezer bags. These are easy to pop out and just cook as is. No need to thaw. Cook at 350 until your meat is done. Watch the last 1/2 hour as the peppers can burn on the edges, so cover with foil. I am not impressed with freezing zucchini as it tends to be very mushy when thawed. The best way is to use it to make bread or bars with it and then freeze it . I do freeze the hard squash like acorn or a butter squash. Just cut the squash in half, bake face down on a parchment lined cookie sheet until done. Let cool, scoop out the squash and put in a freezer container. When thawed, you can just add what you like to taste such as, butter, brown sugar, salt and pepper and warm in the oven. At the end of the cooking you can add marshmallows to the top if you desire. 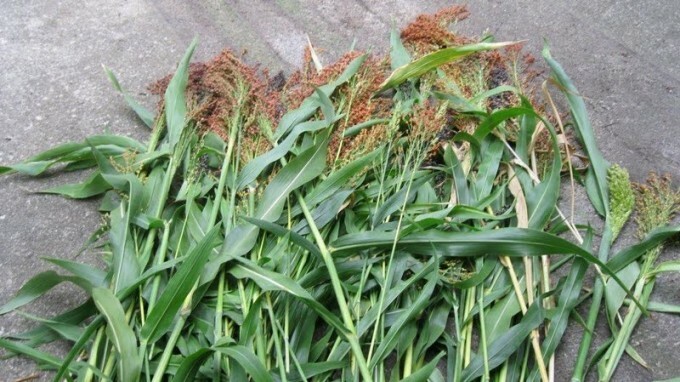 You will also see that I have harvested broom corn. I lay this out in my garage to finish drying and will use it for fall decorating! I love this time of year when it cools down and the air is a little crisper. Soon I’ll be busy putting my garden to bed for the winter sleep, and waiting for the renewed bounty in the spring! So colorful and beautiful. Your family must always have full stomachs and full hearts. What do you do with the corn, exactly? Do you use it for inside decorating and if so, does it stay intact or tend to shed? Do you decorate big for fall and Halloween? Can you freeze fresh tomatoes without cooking? I am always sad when the season is over. I loved fresh frozen or fresh canned veggies, but oh, there’s nothing like a garden fresh tomato. MMMMM Snickers, you are going to be able to have some good sauces this Winter. Great bounty! Don’t you love it? I’m jealous. My garden is not nearly as big as yours, but I sure did miss it. I’ll never go another season w/o one. LOL, I do have my lavender to dry, but that is it. I love the corn as decoration. I have heard people freeze without cooking, but I tend to think you need to break up the acid in the tomatoe before freezing. I think this keeps the flavor in the bag. It’s what you prefer in cooking. When cooking and cooling it’s so easy to put the frozen bag in the frig overnight and just put the contents right into the soup or whatever dish that called for tomatoes this way. Broom corn stays in tack. You pick when a little green is left on the stem. I lay it on my gargae floor to dry and use it in fall decorating, share with friends and take the rest to a floral shop. 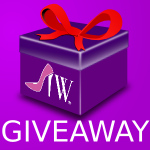 It comes in 3 colors, a dark purple, a red , and a natural tan/green color. It grows just like corn in the field, but has a floppy head of seeds on it. It will keep longer than you would ever want it around. I had some for over a year and it didn’t drop one seed. I do fall decorating as harvest season is a blessing and everyone enjoys the cool fall weather. I harvest my pumpkins and gourds, and use this all together. Now if I just had all those carrots and potatoes dug!! Snickers I love this post. Im aalittle behind you because the hail set me back a bit. But hopefully I will catch up before its too late. Am praying for anyone on the East Coast this weekend. Please be safe. Could anything be more pleasing to the eye than what surrounds you, snickers! Green w. envy & ripe w. I heart you for sharing! Can’t imagine what it must be like to stroll your garden & eat healthy for months – w/o having to hit a grocery store! Aw, fall is my FAVORITE season, snickers, and you know why…everything you mention here. No, I rarely do any work growing or canning the produce, but I do purchase the things you grow, and I love the foods you mention. Stuffed peppers…mmm, I can’t wait. Shopping in the store in the winter means lower grocery prices for this house. The basics add up enough on their own. Give me some yeast, butter, sugar, flour, egss and milk and no need for much else. I bake my own bread and rolls, so if it’s storms outside, I can just watch the snow. 🙂 I will be heading to the apple orchard soon, so that I have a few bags frozen. I love apple cake and muffins, and the kids love apple pie. If they are nice, might make some apple butter. Yummy!! It is overcast here today with a Northern wind, we are getting a very nice breeze, it is wonderful to finally have some crisp air. It was a very hot summer. Ahh, wonder how that magic happened. Thanks to all the IW ladies for enjoying my garden with me this year. Looking forward to winter with maybe some new additions from the garden to something new, or in my case, old! They have picked up a couple of our posts lately. Kudos to Snickers! 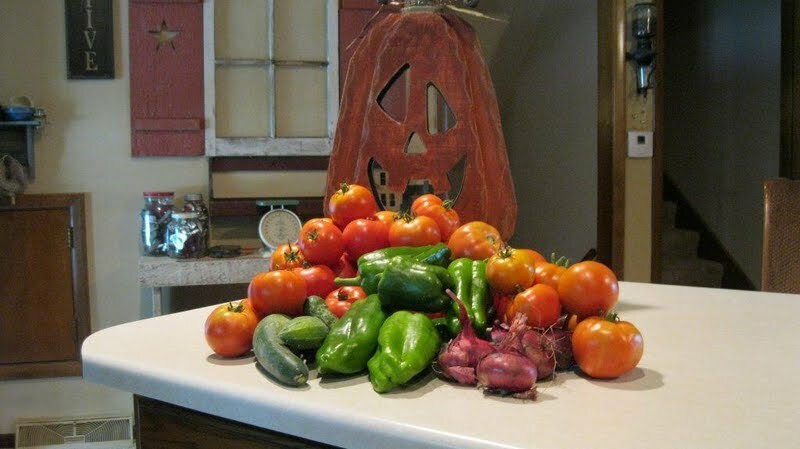 Another great post from Snickers – your garden is inspirational! Thanks Jennie, Pam and all the mods here. I have enjoyed sharing my garden with all of you. I will have one last fall post for everyone. You know those cobwebs, black cats and pumpkins are coming along with fall harvest for many farm families. I’m late, but I did want to say I very much enjoyed your latest column and all the tips! Fall havest – I can’t wait to hear more about this. I agree with others – it’s the best time of the year! I’m spending the winter with Snickers! Everything you grow looks so beautiful and delicious. 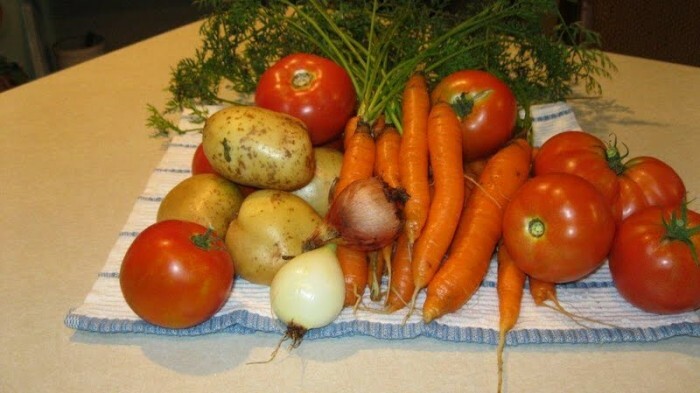 There is nothing better than fresh veggies from the garden. Are the flowers from your garden too? If you grow butternut squash how big does it get? This first year I tried it. Its so big I wont even be able to lift it and its still green. I have no idea why your squash is so big. It’s still early to be picking squash, the vines should die down and the stem is easy to just break off. My butternut squash is usally the size of family size loaf of bread if that makes sense to you. Just let them be, you can even harvest squash after the first frost. Hope this helps!! How do you do all this? I am so freaking tired. Oh thats right I planted a farm. Shoot me please!!!!!!!!!!!!! Ill have new pics in next few days. Wait till you see the squash. YIKES. Ill have a few more pics added tomorrow. Alot of tomatoes, peppers and I must show you the big squash. I didnt realize I got a hybrid squash that weighs over 30 lbs. Shoot me lol. I plant my pumpkins, squash and gourds in the country next to the field corn. It’s a hunt for me when it’s time to harvest. They weave in between the rows, keeps them cool and no sunburn marks. 🙂 I am anxious for the Halloween and Thanksgiving decorating. I love the colors of fall. Snickers that is butternut squash not zucchini. Its a hybrid one. Its huge. I just hope it has enough time to get ripe.Then I dont know what Ill do with a 30 lb squash let alone 10 30 LB squashes.All I have left now is the tomatoes, peppers, melons, pumpkins and squash. Oh lima beans too. Im glad you liked it. I got more pics tommorrow to post. I hope youll check back. OH the peppers. I pickle the jalapenoes, make tabasco sauce with them hot red freakers and they are hot, and the big ones I roast, peel, seed and freeze. We eat alot of all of them around here. Ill take a pic of my freezer tomorrow as well. I’ll check back!! Frost condtions could be early for us this year, so hope you get to harvest all your goodies. I have learned I only need one banana pepper. I’m still picking!! LOL I still have one row of carrots and some potatoes to dig. I planted too many different peppers. My carrots are done. I cant grow potatoes. Your garden is wonderful. You should be proud! Thanks Pam. Im alittle overwhelmed and well my fingers are on fire thanks to the peppers. But yes its a nice garden for a change even if I got set back a bit. Posted a couple new pics today Snickers. Not gonna show you my freezers though LOL. They so unorganized at moment. Have you tried to grow a potatoe in an old tire. You need a mix of good black dirt with some sand. You just fill the tire and plant. You also could use a round plastic container. It’s your soil type I’ll bet is why they won’t grow. My potatoes are very nice this year. I might try potatoes again next year now that we got the watering right. Yes I think its the soil. Its so dry around here. This is the first year I got some good onions. Actually this is the first year I got alot of anything. Yep I think I might do things alittle different next year but after 3 years of trying and getting hailed on every year I tend to go over the top. I measured some of the squash. 24 inches long and 19 inches wide. What am I gonna do with that? I would leave it on the vine as long as possible. If fear of first frost, cover. You could donate some to food banks or neighbors like I do. Harvest and enjoy!! You can bake and freeze squarsh. Just don’t add anything to it, until you thaw and ready to heat again. Lynn, those are wild. LOL. Wild is an understatement LOL. I hope everyone on the east coast is safe. Snickers, do you happen to have a good recipe for fried green tomatoes? I have a feeling I am gonna end up with some green tomatoes and havent had them since I was a kid. I cant remember how to make them. I googled and there are so many recipes I dont know which one to make LOL.If you have a good one could you let me know. Thank you. I don’t do fried tomatoes. Maybe someone else here could help you out. Sorry!! I would think it would be like an egg plant batter. Yes?? OK thanks anyways Snickers. Ill try something and see if I like it. Everyone please pray for all the flooding victims in the northeast. My whole family is in the Bingamton region and I havent been able to get a hold of any of them. Im freaking out about now but maybe tomorrow. I know the services have been cut in alot of that area. Will keep them in my thoughts and prayers also. Let us know. Thank you. Me too but I am too far away to check on anyone. Have you seen some of the disaster going on up there? I have seen it on TV and people are posting about it on Facebook. Looks bad. Thanks Lynn for the link. So very sad for all of them. 🙁 Please know we are thinking of all of them, and sending prayers that everyone is safe. That picture on the main area of that site is about 1/2 mile from where my mom lives.My dad is in an area away from the river but is prone to flash flooding. He is also a volunteer firefighter so he might be out. My sister lives on a hill I dont think she got flooded but loss of power is likely. So I think all will be well. I hope. I hate being so far away. I got a hold of my dad in the middle of the night of course. Hes ok and my sister is ok. He doesnt know about my mom though. But sounds like shes under water. She lives in a retirement community type thing so if they were going to be under water I am sure they evacuated. Will try calling her later. But looks like everyone is ok. Mom is ok. My sister got her out yesterday. She is staying up there for probably a week before she can go back. That should be interesting mom, sister, brother in law, 3 neices, 2 dogs, a cat and moms bird under one roof for a week. LOL. Anyways alot of devastation in that area. I dont know how they will ever recover. Snickers I added 4 new pics on my account of what I picked today. Help me. Help me. LOL. I do believe any peppers I have left after this batch which I have alot left out there will be given away. The tomatoes not just yet I havent gotten enough. The cantaloupe are on the verge of giving away as well. Who would have thought Id get so much after the wind destroying half my plants then the hail. I think I will be in for it when the squash and watermelon get ripe. Now that is just scary. It has literally been years since I have canned. Husband gave away my jars when we moved! But this year’s bumper crop of tomatoes has me contemplating it. Just need to get some jars! One of the best things you can get as a gardener is a canner and a dehydrator! I dehydrate everything and then if I don’t end up using it I add it to my puppies food for better nutrition! I would love to have a garden. I’m looking to move back to the country, and I would love to do this.